This part describes in detail the configuration options for CloverDX Server used in a production environment. In the following chapters, you will find information on setting required properties and parameters, description of CloverDX Server's Setup GUI elements, parameters for specific database configuration, list of properties used in general configuration, instructions on encrypting confidential properties and log files setting. We recommend the default installation (without any configuration) only for evaluation purposes. For production use, you should configure a dedicated, system database and set up an SMTP server for sending notifications. 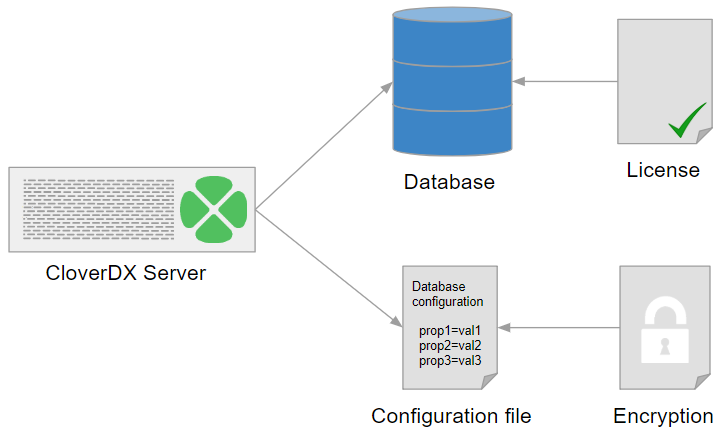 Choose a source of configuration data for CloverDX Server. There are several options for configuration sources; however, we recommend using a property file on specified location. For more information, see Chapter 12, Configuration Sources. Now, you should set up a CloverDX Server's database and configure a connection to the database. Choose a supported database system and read Chapter 14, System Database Configuration for information and examples on how to create a database, add user/role for Clover, grant it required rights/privileges, etc. Once you have set up the database, configure CloverDX Server's connection to the database using the Setup GUI. After you have set up the database, configured the connection to it and specified the source for configuration data, you can activate the Server with your license. While it is possible to activate the Server immediately after installation, we do not recommend this, since after the activation, the license information is stored in the database. To activate the Server, follow the information in the Activation section. Finally, you can configure the server features. The Setup with a user friendly GUI allows you to configure the basic, most important features including, encryption of sensitive data, SMTP for email notifications, etc. For more information, see Chapter 13, Setup. Worker is the executor of jobs, all jobs run in the Worker by default. It runs in a separate process (JVM), so it requires configuration in addition to the Server Core. Basic configuration of the Worker can be done in the Worker page of the Setup. For all configuration properties of Worker see Worker - Configuration Properties. See the Chapter 26, Troubleshooting Worker section for useful tips on solving issues. Heap memory size - required heap size for Server Core and Worker depends on the nature of executed jobs. In general, Worker should have higher heap allocated, as it runs the jobs which represent the bulk of memory consumption. Heap size of Worker can be easily configured in the Worker tab of Setup, or via the worker.maxHeapSize configuration property. Classpath - the Worker's classpath is separate from Server Core (i.e. application container classpath). Any libraries needed by jobs executed on Worker need to be added on the Worker's classpath. See the worker.classpath configuration property for more details. Command line options - Worker is started as a separate process with its own JVM. If you need to set JVM command line options, e.g. for garbage collector tweaking, better diagnostics, etc., then you need to set them on the Worker's JVM. See Additional Diagnostic Tools section for useful options for troubleshooting and debugging Worker. Command line options of Worker can be easily customized in the Worker tab of Setup, or via the worker.jvmOptions configuration property. JNDI - Worker has its own JNDI pool separate from the application container JNDI pool. If your jobs use JNDI resources (to obtain JDBC or JMS connections), you have to configure the Worker's JNDI pool and its resources. See JNDI in worker section for more details. As the last step, we strongly recommend you to encrypt the configuration file to protect your sensitive data. For more information, see the Encryption section.